By the conclusion of The Edge Of Destruction the Doctor has seized the upper hand and has apparently reduced Ian, Barbara and Susan into a drugged sleep. In the second episode the narrative rapidly switches from mutual paranoia and suspicion, within a domestic environment, where Ian attempts to strangle both Barbara and the Doctor, to a more rational, science based explanation for the odd goings on. 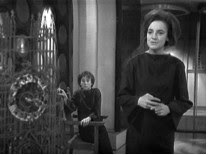 Barbara rationalises the Gothic trappings of the destroyed clock faces, the decaying home of the TARDIS, as a warning that the crew are running out of time. 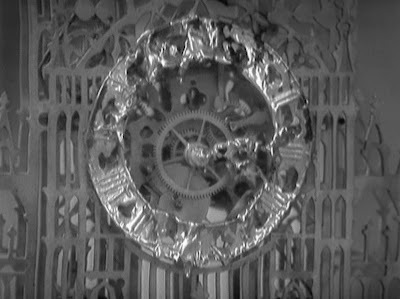 The melting clock face also evokes the surrealism of Salvador Dali's Persistence Of Memory with its softened clocks matching the clocks and watches affected in the story. Dali's imagery, in 1931’s Persistence Of Memory, part of Dalí's Freudian phase: ‘juxtaposes two ordinary symbols of time: clocks and sand; but in Dalí’s arresting vision the clocks are melting over a vast and lonely beach that resembles the sands of time. To emphasise the painting’s temporal images, he also incorporates a swarm of crawling ants, whose uniquely shaped bodies resemble hourglasses. Sand, hourglasses, and watches all connect below the threshold of awareness till the viewer’s mind swings around to focus on the very nature and meaning of time. . . .’ and suggests a meditation on the theories of relativity as symbolised by the Doctor and the TARDIS and their passage back and forth through time and space. His later revision of 1952 to 1954 Disintegration Of Persistence Of Memory where Dalí 'disintegrated’ the scene from the 1931 original, are an acknowledgment of the developments of modern science and transmitted his own anxieties and fears about the dropping of the atomic bomb in 1945. The elements of the earlier painting are 'atomised' and forms populating the barren landscape are disintegrating as a result of the bomb. The Brink Of Disaster is also punctuated by thundering booms and blasts of bright white light. There are a number of connected readings here about the series own positioning within science fiction narratives about the nuclear age as well as its ongoing relationship to European fine art movements. When the TARDIS mushroom shaped central column activates in a blast of white light and the Doctor intones ‘We have ten minutes to survive’ I think the symbolism is very obvious. 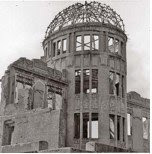 The symbols of melted clocks are also representative of the iconic images from Hiroshima of the clock face stopped at 8.15 and the skeletal remains of the Gembaku Dome. The paranoia of entrapment in the Gothic home has been supplanted by the spectre of nuclear Armageddon and the growing tensions of the Cold War. ‘They have five minutes only. 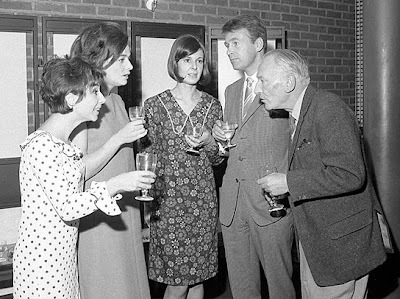 When the end does come, they won’t know anything about it,’ confides the Doctor to Ian about Susan and Barbara. The previous sexual tensions and gender blurring are further diffused by the effects of the TARDIS which is trying to warn our characters about an impending disaster. All are equal under the threat of a nuclear war it would seem but it is still significant that it is Barbara, using her female intuition, who strings together the various meaning of the clues left by the TARDIS. This culminates in that stupendous moment of realisation where the Doctor reasons that the TARDIS is caught up in the fission of material, a nuclear chain reaction that is forming a new sun. This transposes the twin suns, one the birth of a new star, and one of destruction as symbolised in the detonation of the nuclear bomb. The other character in the story is, of course, the TARDIS. We get two episodes that fully explore Brachacki's design for the TARDIS and the additional work that Cusick then provided with his connecting doors and the fold out couches. What's really great is the way the TARDIS is lit. It's gloom penetrated by key lights from above that spread big circular patterns across the walls and floors that look almost cellular. It's a tremendous shock and revelation when at the end of The Brink Of Disaster, the console lights up, the room gets brighter and you hear Brian Hodgson's sound effects going hell for leather. The ‘fast return’ switch is an irrelevance. It’s as broken as the four leading characters. 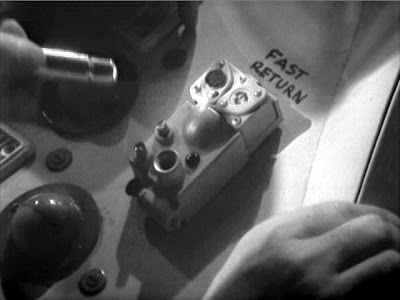 The fifth character, the TARDIS, is also deconstructed by introducing the idea that the TARDIS console and time column directly harness the energies which drive the ship, and that the TARDIS is "alive" and somewhat self-aware. Whilst we get a sense that the TARDIS is alive, Whitaker is using the two episodes to elaborate more about the 'broken' nature of the relationships between it and the Doctor, Susan, Ian and Barbara. The direction by Richard Martin and Frank Cox manages to make a great deal out of the use of this one set and the four characters. Cox tends to go for a lot more movement across and through the frame and seems determined to get the camera into places that it shouldn't really go. Martin's work is more formal with a tendency to go for static shots and cross cutting in the gallery. But they both heap on the atmosphere and get realistic and committed performances from the cast. It's too easy to dismiss the story because of the rather anti-climactic discovery that all these psychological shennanigans is caused by a broken spring on a button on the console. However, that isn’t the real climax of the story at all. The story itself has been concerned with atomising our characters and turning them into unstable, fissionable material. The re-fusion of the main characters is the essential climax where all the relationships are re-established. The aim here is to examine the characters, deconstruct them to an extent and then put them back together again. The acting honours pretty much go to Jacqueline Hill. She carries much of the central premise with a great deal of dignity and offers up an intuitive, sensitive portrayal of Barbara. She is also effective in providing a sense of Barbara's disappointment and anger with the Doctor that can equally be situated within the hysteria that Susan generates. Her attack on the Doctor is a blistering indictment of the Doctor’s anti-heroic status and could be seen as a catalyst for change in his attitude towards the two schoolteachers. After all, he's accused both Ian and Barbara of sabotage and subterfuge and she takes it very personally whilst Ian seems to shrug it off. William Russell provides an interesting contrast to the Ian we have seen in the previous 11 episodes. He’s almost in a daydream, slightly off-centre from the character we know. Contrast this with the somewhat shrill, manic state of hysteria that Carole Ann Ford plunges Susan into. Ford's over the top quality has been criticised but her performance has a real sense of danger to it and is entirely fitting when it is positioned within the context of the feminine and the Gothic. Physically, she's slightly awkward and stilted but, for television still mired in presenting drama within a theatrical mode, it does at least attempt a level of improvisational realism. Hartnell, having learnt his craft from a different tradition, does stumble over lines but, again, seizes an opportunity to improvise and emphasise the darker, anti-heroic aspects of the character of the Doctor so that even by the conclusion you don't particularly trust this man anymore than you did at the start. 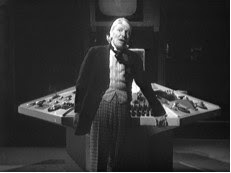 The pivotal moment when Hartnell is splayed across the console in The Brink Of Disaster, the rest of the set in darkness and with one key light on him as he describes the formation of matter and dust of galaxies is hair-raising, especially that little bit at the end where he giddily clenches his fists to his face. That's a genuinely televisual moment, comparable to Ian and Barbara bursting into the TARDIS in An Unearthly Child or the advance of the Dalek arm in the cliffhanger to the first episode of The Daleks. He’s addressing us as viewers directly, using the meta-theatricality of the situation to tear down the fourth wall of television and share the exhilaration of the character’s inner journey. He also threatens, bullies, manipulates and capitulates to get help from Ian and Barbara when he realises he can't cope with the situation on his own. ‘You still haven’t forgiven me have you?’ he says poignantly, and it is only when Barbara allows herself to forgive him that you get a sense that this group of people are now connected and we move into the wonderful dynamic to be found in later stories such as Marco Polo and The Aztecs. The Doctor himself underlines the oppositions of female instinct and male logic that run through the story and concludes that it is Barbara who is the heroine of the hour.